Bakushuan Ebisu, opened in 2014, is a sister izakaya of Shutoan in Yotsuya Sanchome and is the second Bakushuan outlet, with the original being located in Otsuka. Unlike the outlet in Otsuka, this bar does not serve raw oysters. 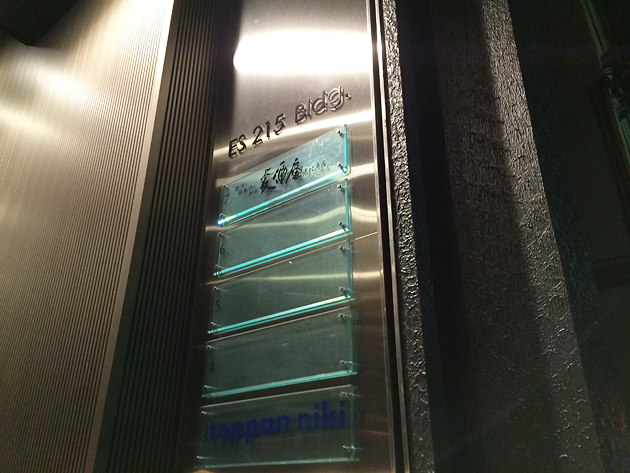 Located on the seventh floor of the building, it has a small space with relaxing ambience. I started off with beer. 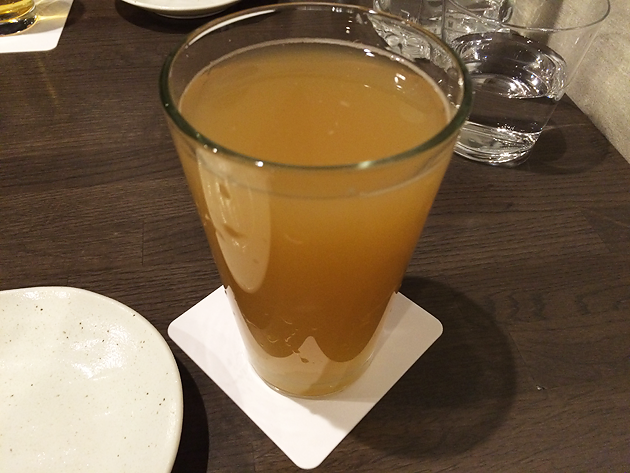 Among many unfamiliar craft beers on the menu, I chose apple beer from the Shinshu region. Although unfamiliar beers tend to feel sort of “awkward” in your mouth, its cider-like flavor with perfect acidity tasted familiar to me. 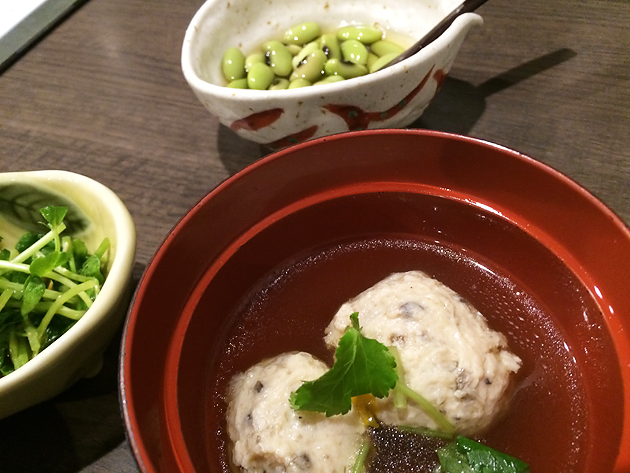 First came three kinds of otoshi, or startars. 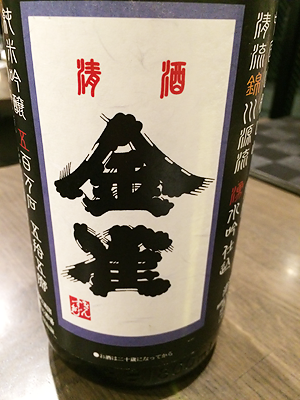 It’s unusual to have soup for a starter, but it was actually really good to enjoy sake with this dashi-based soup. I could tell there was meticulous preparation behind the delicious taste. 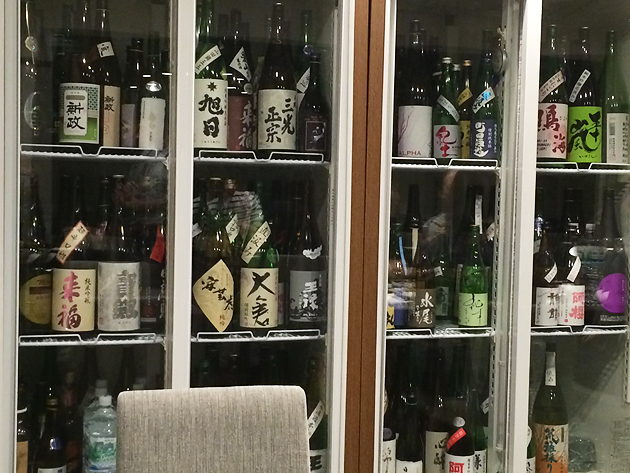 Although the name “Bakushuan” makes it look like a beer bar, it actually specializes in sake as well. 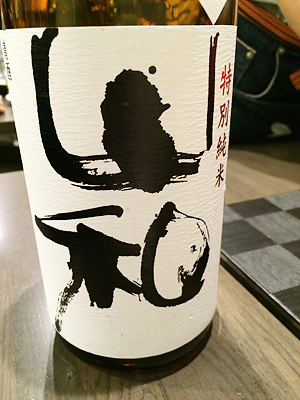 In fact, the master was busy in sake tasting while I was there. I told my preference and asked for his recommendation. I was served Yamawa from Yamawa Shuzo of Miyagi and Sanko Masamune Tembu from Sanko Masamune Shuzo of Okayama. 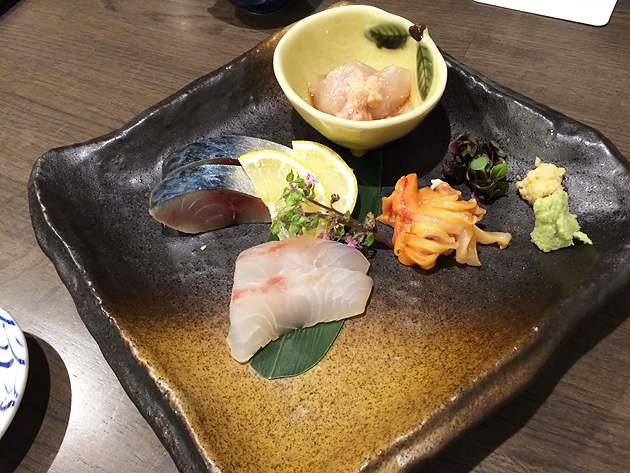 Assorted sashimi was vinegared mackerel, sea bream, bloody clam and thread-sail filefish. I had heard that dishes would come slowly because there was only one chef, but I didn’t wait so long. 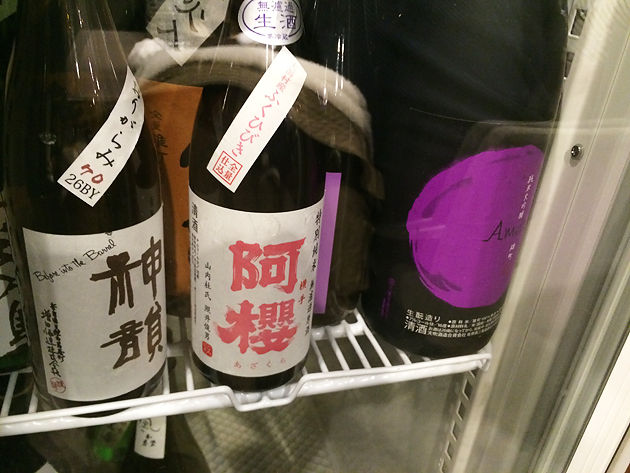 The above are Juji-asahi from Asahi Shuzo of Shimane and Kinsuzume from Horie-sakaba of Yamaguchi. 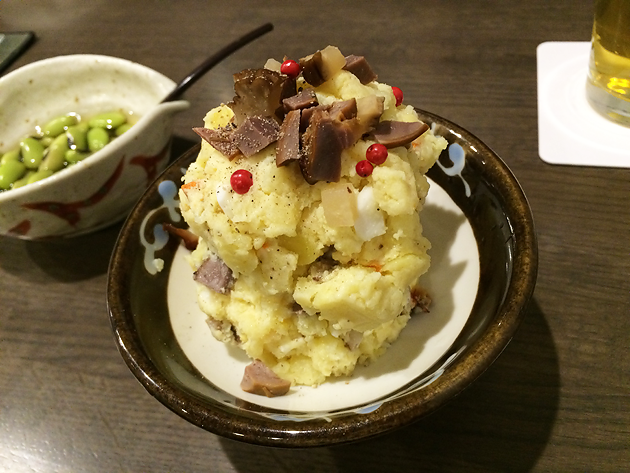 The potato salad topped with minced iburi-gakko (smoked daikon pickle) and smoked chicken gizzard paired nicely with sake. 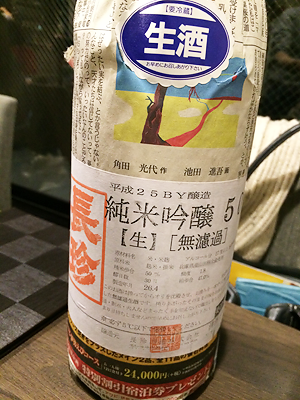 Chochin, the sake with a unique look with a sheet of newspaper wrapped around it under the label, is from Chochin Shuzo of Aichi. Sumiyama is from Koimari-Syuzou of Saga. 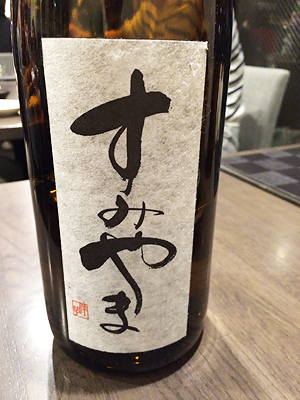 The not-so-spacious bar was packed with many sakes, including “阿櫻 (Azakura)” from Akita, made of the Fukuhibiki brand rice; “神韻 (Shinin),” origarami (sake with a slight amount of lees) from Masuda Shuzo of Nara; and “天吹 (Amabuki)” from Saga—a lineup that revealed the master’s deep passion for sake. Copyright (C) 2019 Osakelist All Rights Reserved.